If you belong to Christ, then you are Abraham’s descendants, heirs according to promise (Gal 3:29). Where a will is, there must of necessity be the death of the one who made it (Heb 9:16). Usually, we receive an inheritance when someone has died, and left us something in their will. Jesus, the firstborn, has died for us. He received judgment so that we can receive blessing: an eternal inheritance. The Hebrew word nachalah means inheritance, possession of property, or heritage. It is used 273 times in the Old Testament; on 183 occasions it relates to land as a gift. The Hebrew word yarash means to seize, dispossess, take possession of, or inherit. It is used 255 times in the Old Testament; on 210 occasions it relates to military action. Our inheritance, then, is given by grace as a gift but is received by taking possession of it. And there can be a significant difference between what God is willing to give us and what we are willing to receive (or take possession of). His will for us is our eternal destiny and our inheritance. Just as Joshua led God’s people to possess their inheritance, so we are to be a Joshua Generation who lead people in to receive their own inheritance in God. Eternal life, starting now (not only when we die). Redemption, being bought back out of slavery into freedom. Reconciliation with God, who welcomes us back into relationship in His family..
Destiny, purpose and Jesus’ mantle: His authority, which He has left for us to pick up. All things that the Father has are Mine; therefore I said that He takes of Mine and will disclose it to you (John 16:15). But as many as received Him, to them He gave the right to become children of God, even to those who believe in His name (John 1:12). The Spirit Himself testifies with our spirit that we are children of God, and if children, heirs also, heirs of God and fellow heirs with Christ (Rom 8:16-17). We have a share in everything that belongs to God (and that is absolutely everything), if we believe. He is not a stingy Father. He does not want to hold anything back. He wants us to know what is ours. For as many as are the promises of God, they all find their Yes (answer) in Him (Christ) (2Cor 1:20 AMP). And if you belong to Christ, then you are Abraham’s descendants, heirs according to promise (Gal 3:29). For by these He has granted to us His precious and magnificent promises, so that by them you may become partakers of the divine nature (2 Peter 1:4). Blessed be the God and Father of our Lord Jesus Christ, who has blessed us with every spiritual blessing in the heavenly places in Christ… and raised us up with Him, and seated us with Him in the heavenly places in Christ Jesus (Eph 1:3, 2:6). And Jesus came up and spoke to them, saying, “All authority has been given to Me in heaven and on earth. Go therefore and make disciples of all the nations, baptizing them in the name of the Father and the Son and the Holy Spirit, teaching them to observe all that I commanded you; and lo, I am with you always, even to the end of the age” (Matt 28:18-20). In John, chapters 13-17, Jesus speaks a great deal about our inheritance, and about His relationship with the Father, and the relationship He wants us to have with Him. To understand our inheritance, we need to look at the beginning (the book of Genesis), to see what God’s original intention was for us; we also need to look at the end (the book of Revelation), to see how God’s intention is fulfilled. As we do, we see many parallels between the beginning and the end. We live in the middle, though, and God wants us to play our part in bringing about that end. This is all about restoration. God is looking to restore to us all that was originally intended in the garden, so that we can find the final consummation of that in the eternal garden of God. We were made in His image, to rule (Gen 1:26-28). Then the Lord God formed man of dust from the ground, and breathed into his nostrils the breath of life; and man became a living being. The Lord God planted a garden toward the east, in Eden; and there He placed the man whom He had formed… Now a river flowed out of Eden to water the garden; and from there it divided and became four rivers (Gen 2:7-10). You were in Eden, the garden of God; You were the anointed cherub who covers, And I placed you there. You were on the holy mountain of God; You walked in the midst of the stones of fire (Ezek 28:13-14). Eden was on the holy mountain of God, and the two gardens of heaven and earth overlapped and intersected. That is where our physical and our spiritual inheritance comes together. Adam and Eve were excluded because of sin, but Jesus has opened up for us the way to access the tree of life once again. The garden of our hearts overlaps with the garden of God, and we can walk with him in the garden once more. Then I saw a new heaven and a new earth; for the first heaven and the first earth passed away, and there is no longer any sea… And I heard a loud voice from the throne, saying, “Behold, the home of God is among men, and He will dwell among them, and they shall be His people, and God Himself will be among them (Rev 21:1,3). Then he showed me a river of the water of life, clear as crystal, coming from the throne of God and of the Lamb, in the middle of its street. On either side of the river was the tree of life… And there will no longer be any night; and they will not have need of the light of a lamp nor the light of the sun, because the Lord God will illumine them; and they will reign forever and ever (Rev 22:1-2, 5). … that He may send Jesus, the Christ appointed for you, whom heaven must receive until the period of restoration of all things about which God spoke by the mouth of His holy prophets from ancient time (Acts 3:20-21). It is very important to see how inheritance is first introduced in the Bible, because the first mention determines how that word is to be interpreted throughout the scriptures. “I am the God of Bethel, where you anointed a pillar, where you made a vow to Me; now arise, leave this land, and return to the land of your birth”. Rachel and Leah said to him, “Do we still have any portion or inheritance in our father’s house?” (Gen 31:13-14). Let us ask the same question, do we still have any portion or inheritance in our Father’s house? And if we do, what and where is His house? (The name Bethel actually means ‘the house of God’). Where is ‘the land of our birth’ to which we should return? Our heritage of covenant stretches back to Adam, and Abraham’s covenant is our connection to our inheritance: “in you all the families of the earth will be blessed” (Gen 12:1-3). God appeared to Abraham at Bethel (Gen 12:7-8). And when his grandson Jacob later came to Bethel, it was there that he saw a ladder reaching to heaven and angels of God ascending and descending, and said, “How awesome is this place! This is none other than the house of God, and this is the gate of heaven” (Gen 28:10-17). Our relationship with God brings us back to a place where heaven is open, and where we ourselves become a gate of heaven and a house of God. Immediately coming up out of the water, He saw the heavens opening, and the Spirit like a dove descending upon Him; and a voice came out of the heavens: “You are My beloved Son, in You I am well-pleased.” (Mark 1:10-11). God desires to legitimise who you are, to recognise you as His child. We are under an open heaven. Father God is standing on the threshold of heaven and earth, and speaks words of affirmation, encouragement and legitimacy over you. I call forth your spiritual destiny. Listen with your spirit to the words that I, your heavenly Father, have for you. I have written your days in My book with love, for your best interest and My ultimate glory. I bless you with the deep knowledge that I know what you need and I have all the resources of the universe to meet that need. Listen with your spirit to My words for you. My Spirit testifies to your spirit that you are My child. the Spirit of counsel, power and fear of the Lord. to see things as I see them in the heavenly realms. spiritually, emotionally, mentally, physically and practically. I bless you with the desire to press forward to see the glory that I am revealing. in you and through your life. I am your inheritance, and you are My inheritance. I declare that I am your Father, and you are My son. I give you access to the river and tree of life. I call you to be a gateway of heaven on the earth. and I call you to be displayed as a mature son on the earth. 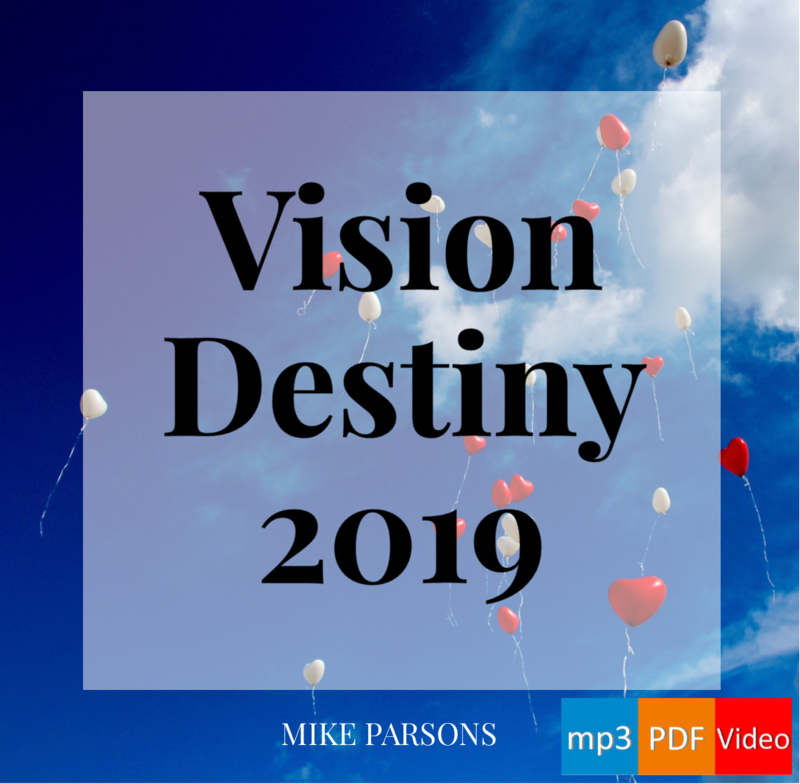 (this post is based on extracts from Mike’s notes for session 1).